More a trio of short novels than a large book, this collection of stories takes you across the stars to often technologically backwards planets that have been out of civilization for so long that their true history has taken the form of myths. In book 1, the Ler are introduced. This species was created by mankind looking for a superhuman species. Instead, they just got a different cousin type species that had different values and ideas from their creators. They focus on a game, which leads them to a new destiny. In book 2, taking place hundreds of years later, humans and Lers have occupied the far reaches of space. A joint expedition is sent out to determine what has happened to a violent group of Lers and why they have deviated so far from their origins. In book 3, another long time jump later (hundreds to thousands of years), a planet full of humans that have been bred to be racially pure (there's a race that's been bred for working with technology, one for fair skin and red hair, one for hard labor, etc, etc. There, a new human/Ler expedition seeks to discover how this planet eroded and how to fix life for these previously segregated and bred humans.All in all, while the books are only loosely related, that lax connection aids the mythical nature of all the stories of the various people in these novels and explores how moments in the time and evolution of various species can get lost to history and distort the understanding of the present and the expectations for the future. By looking at time frames through stories that take place over a span of thousands of years, the author explores the goals and aims of mankind, the ultimate proximity all civilizations retain to the caves from where they sprung, and how beliefs, myths and histories are built into the cultures that they in turn help to shape. I would like to thank DAW books for enabling my nostalgia kick rereading of books I read in high school.I got this for The Gameplayers of Zan, which I remember liking a whole lot. The other two books were written earlier and are trivial.The Gameplayers of Zan takes place on Earth, where human overpopulation has resulted in an regimented, hierarchical, and homogenous society. The ler number in the thousands, I think, and live on a reservation, with a low population density and a deliberately primitive lifestyle. The exploration of the ler culture is the best part.The book opens with the thirty-page interior monologue (indirect discourse, not first person) of a woman in a sensory deprivation chamber, meditating on space, history, order, chance, the evolution of human societies, and adolescent sexual experiences. No wonder it reminded me of C.J. Cherryh. But god is Foster verbose. The bit about a ler woman teaching humans and then going home on a monorail through the woods isn't any less slow, self-reflective, and expository than the bits in the sensory deprivation chamber. There are footnotes, although given the amount of information Foster was willing to put into narrative exposition, I'm not sure why he needed them. I was thinking about trying some of Foster's later books, but I'm not sure I can get through the prose without the ameliorating effects of nostalgia. This compilation of three out of print books is worth buying just for the one story that falls chronologically first though published second: The Game Players of Zan.The other two stories are only loosely related and are really not worth reading. The writing can be a bit boring at times and the author is far too fond of huge info dumps for the modern audience, but it is still a classic with some amazingly original ideas. Brilliant world building.The Game Players of Zan is sort of a mystery but the mystery itself turns out to be petty and uninteresting. The brilliance is in the world building. The author has created an entirely artificial society and species that were designed rather than evolved and explores what that might be like.The Ler or "new people" as they call themselves are a race created be human from humans to be superior. The next step in evolution. The experiment is somewhat of a failure from their creators point of view, but the Ler create their own society with its own rules and live apart from humans.Everything about them, from their choice to live simply (primitively by human judgment) to their family system called braids is utterly fascinating. Exactly how the braids works is very simply and directly explained the Warriors of Dawn, but it is more interesting in The Game Players of Zan, which I read first. The reader is sort of pulled along into their world and it all more than a little exotic. Even though their society was created wholly in one generation by the first created beings, it feels natural and organic. even though they are are mostly human generically, they feel alien and yet understandable.It is a must read classic story. One of my favourite SF series is the Ler trilogy by M A Foster. Now combined into one volume, The Book of the Ler, it's the story of a race of humans created by mankind who become humanity's cousins in the journey to the stars. The first book, The Game Players of Zan, describes their life in a special preserve on earth. The second, The Warriors of Dawn, is about the a human and a Ler who team up to find a renegade tribe of Ler in a remote solar system. The series concludes with The Day of the Klesh. I could write pages on these books, so well-crafted they are. I will suffice it to say that it's one of the few series novels I have re-read and taken notes. Too sad - this book was spoiled to begin with by an unfortunate run in with an old lecher at Barnes & Noble. Sigh - I hope its so good that I forget all about him. Contains 'The Gameplayers of Zan' which is sublime, intelligent sci-fi and probably the best book I have ever read. M.A. Foster - US writer, former data-systems analyst and sequentially a Russian linguist and ICBM launch-crew commander to the US Air Force; he is also a semiprofessional photographer. After some poetry, released privately as Shards from Byzantium (coll 1969 chap) and The Vaseline Dreams of Hundifer Jones (coll 1970 chap), he began to publish sf with the ambitious Ler trilogy about a race of Supermen created by Genetic Engineering whose social structure is built around a form of line marriage here called a braid. 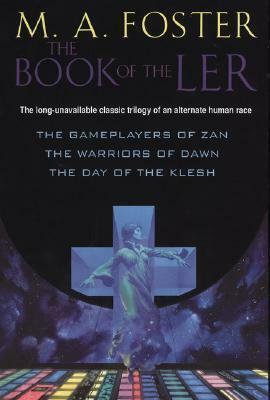 The Gameplayers of Zan (1977), a very long novel formally constructed on the model of an Elizabethan tragedy, describes a period of climactic tension between the ler and the rest of humanity, and is set on Earth. The Warriors of Dawn (1975), published first but set later, is a more conventional Space Opera in which a human male and a ler female are forced to team up to try to solve a complexly ramifying problem of interstellar piracy. The Day of the Klesh (1979) brings the ler and the eponymous race of humans together on a planet where they must solve their differences. The Morphodite/Transformer sequence which followed comprises The Morphodite (1981), Transformer (1983) and Preserver (1985), all three assembled as The Transformer Trilogy (omni 2006), and similarly uses forms of meditative Shapeshifting to buttress complex plots, though in this case the alternately male or female, revolution-fomenting, protagonist dominates the tale as assassin, trickster and Superman. Waves (1980) rather recalls Stanisław Lem's Solaris (1961) in a tale of political intrigue on a planet whose ocean is intelligent. The four novellas collected in Owl Time (coll 1985) are told in challengingly various modes, and derive strength from their mutual contrast.More recently, the author has been involved with the writing of storylines for Acme comics acmecomics/node/69.